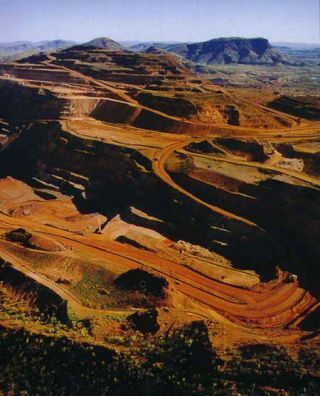 Landscape of mining operations in Western Australia. Such areas are rich in banded iron formations, features of interest to Mars scientists, and serve as Mars analogue sites. The initialstep for any exploration is the scouting expedition. We have all been taughtthat in 1803 Meriwether Lewis and William Clark set out across the NorthAmerican continent to explore the uncharted West. They thought they might findwoolly mammoths, and hoped to find a water route across the vast continent. Insteadthey found daunting mountain ranges, fascinating native cultures, and waterranging in form from dramatic cascades to stagnant salt pools. Today's astrobiologists,those intrepid modern day explorers investigating the possibilities for life inthe universe, are still following the water. One exemplar of this phenomenon isDr. Adrian Brown, a Carl Sagan Center geologist/astrobiologist and a nativeAustralian, who will lead a September scouting expedition of spectroscopiststhrough the Western Australian desert in search of dry acidic lakes and bandediron deposits. You may ask, "What is the connection between dry lake bedsand following the water?" The answer is Mars. When NASA's"Mars Czar," G. Scott Hubbard, restructured the current robotic NASAMars Exploration Program, he dubbed the science strategy for the whole program "Followthe Water." Since we know life occurs on earth wherever there is liquidwater (for even a part of the year), if you follow the water on other planets,the path may lead you to life on those other worlds. So far, arguably, thestrategy has been very successful. The Mars Exploration Rovers are still exploring Mars, andcoupled with the latest high resolution images from the Mars ReconnaissanceOrbiter (MRO), are providing an increasingly corroborated story of water onMars both past and possibly even current. To increase our understanding of theMars data, we look to analogous places on earth. There we conduct parallel fieldwork similar to current Mars efforts, and by employing all the sophistication humansand laboratory equipment can provide, vastly improve our understanding of theMars data. Western Australia is a great place to do that. Dr. Brownis a part of the team of scientists working on data from the CompactReconnaissance Imaging Spectrometer for Mars (CRISM)mapping Mars from the MRO spacecraft. A marvelously versatile spectrometer inoperation since last November, CRISM has already returned a mountain ofintriguing data ? more, thus far, than was returned in nine years of operationsby the Mars Global Surveyor, another great spacecraft. CRISM's data are showinga far more complex geology and mineralogy than might have been anticipated andmuch of it points to water. To increase their understanding of this rich dataset, Adrian and his colleagues here on Earth will eventually fly spectrometers2 to 3 kilometers above targeted areas in Western Australia and explore thesame area from the ground with field spectrometers, hand lenses, portablemicroscopes, computers and various other pieces of equipment to expand theirunderstanding of how the spectral images and data relate to actual groundfeatures. To prepare for the expedition, they have to do a scouting run. The crucialstep in any scientific endeavor is to acquire funding. Dr. Brown joined a teamled by Dr. Simon Hook of JPL who successfully proposed the study as a larger interdisciplinaryexploration that will include forays into Brazil and Utah. Their funding agencyis NASA. Brown's international team will accomplish two field expeditions, oneground scouting trip to pinpoint the most useful target areas, which is to befollowed by a second trip next year that will combine flights taking data fromthe air with further ground research. The interlude between the two expeditionswill give them adequate time to study and correlate their data and then compareit to the CRISM data to see what is most useful and how they might improve theapproach. The teamarrives in Perth on September 5th, early spring down under, and hasuntil September 23rd to recover from jet lag. Then, with theirrented vehicles, they explore multiple sites at 3 field targets. To ensure thatall goes smoothly, Adrian is spending a fair chunk of his summer here at theSETI Institute juggling airline schedules, renting the all-wheel-drive vehiclesthat will carry them safely through the Australian outback, coordinating withmining operations they might be visiting ? much of their target area is heavilyinvolved in Australia's growing mining industry ? finding motels that willaccommodate them during their travels, assembling information from drill corelibraries, and handling dozens of other details that will allow the team ofscientists to concentrate on science once they are on their way. Like mostworthwhile endeavors, science is a far more complex business than might first appear,once you peer deeply into the day-to-day working of any aspect of it. Thesedays, I think Dr. Brown is feeling more like a tour guide than a world-classhigh resolution spectroscopist, and is called upon to manage a myriad ofdetails in areas that he might never have dreamed had any connection toscience. Still, once out in the field, he and his team will certainly learnthings that they couldn't have anticipated, and not just about Western Australia. Their efforts have the potential to significantly advance our understanding ofthe CRISM data and Mars. By following the water ? the traces and signatures itleaves behind and the kind of morphologies that harbor those signatures ?Adrian Brown could acquire a critical piece of the puzzle that drives most astrobiologists.There might no longer be "gold in them thar hills," but what if there'slife?